While oil prices are leaving negative impact on USDCAD, this pair is also under the influence of Canadian CPI and retail sales data. The pair is finding support at 1.34130 with resistance at 1.34450 which both lines are above the weekly pivot point at 1.32890. The EMA of 10 is moving with bullish bias and it is located above the EMA of 100 and the EMA of 200. The RSI is moving in overbought area, the MACD indicator is in positive territory and the Stochastic is moving in high ranges, showing upward momentum. The ADX is showing buy signal. 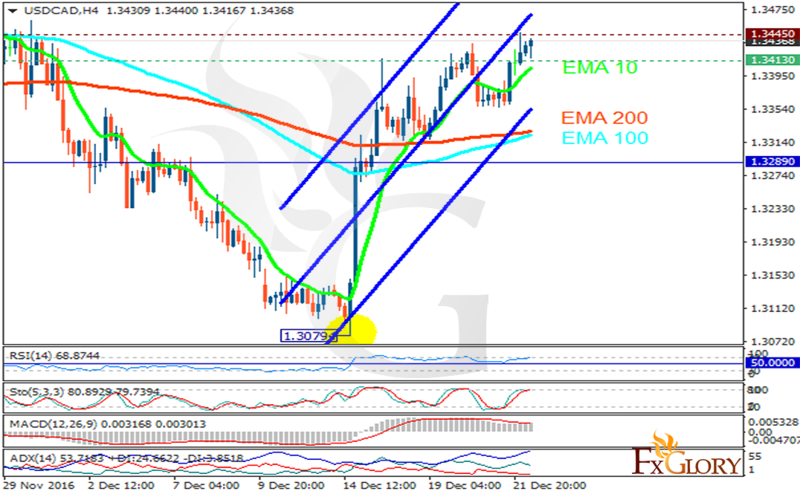 The chart will continue its trend with bullish tone targeting 1.3470.